Americans are guilty of wasting a lot of water. Not only is this bad for the environment, but it also takes money out of your wallet. Utility bills are high enough in the summer because of air conditioners. The last thing you want to do is add a ridiculous water bill on top of that. Using your sprinkler system in an efficient way can help you reduce the amount of water that you use on a daily basis and help you cut back on utility bills at the same time. 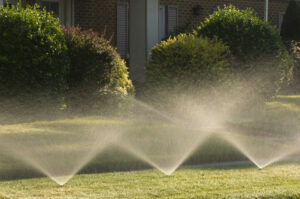 The following tips are some great ways to use your sprinkler system effectively. Water in the morning – Watering early in the morning will help you use less water because the sun won’t cause it to evaporate. It’ll also help keep your grass healthy. If you water in the evening, your grass can actually grow fungus, which can cause it to become unhealthy or die. Set your sprinklers to water shortly before sunrise. Use a rain sensor – Rain sensors for your sprinkler system will shut the system down for you if you aren’t home to shut it off or if you’re not awake when your system turns on. If you get ¾ of an inch to an inch of rain each week, you actually won’t need to water your lawn at all. Try a water gauge in addition to the sensor to find out how much rain your lawn is getting. Make a rain barrel – All of the water that comes out of your downspouts could be wasted if you don’t have a drainage system or rain barrels. Rain barrels can capture rainwater as well as runoff water for you to use for watering purposes. While you won’t really be able to run it through your sprinklers, you can use it for your other plants, saving on that water. Set your sprinklers properly – It sounds obvious, but make sure that your sprinklers are watering your lawn and not your fence or patio. Watering just enough in the appropriate places will help you use only the amount of water you need and nothing more. You’ll also prevent runoff on the street if you monitor how much water you’re using and where it’s going. However you set up your landscaping, it’s important that you use your sprinkler system to effectively water, rather than using up a lot of unnecessary gallons of water and spending more of your paychecks than you want to on rising water bills. If you have any questions about using your sprinkler system efficiently, or to get your free quote today, give us a call at 410-768-4720 or contact us via our website today. This entry was posted on Thursday, May 15th, 2014	at 8:57 pm	and is filed under Lawn Tips	. You can follow any responses to this entry through the RSS 2.0	feed. Both comments and pings are currently closed.